Earlier this week, a friend asked the question, What would I do if Jesus came back right now? It’s a question that often finds its way into my mind, but one that continues to convict me just the same. What would I do if Jesus were to return right now? What if He were to walk into the room – what would I think, what would I do, what would I say? What excuses would I make for not having lived like He has called me to live? For not having witnessed to those living in darkness? What excuse could I possibly offer? So often, we forget about eternity. We live in the moment; we live for ourselves. We don’t think about the fact that everything we are doing now will count for an eternity. We pursue earthly things that promise pleasure, but in the end, those things will all fall away, and we will be left face-to-face with our Maker. Last night, I thought I might die. Caleb and I went to see High School Musical, in which Andrew and Tianna are participating. About a week ago, I had a dream about seeing the musical – but in my dream, shooters came and killed everyone in the auditorium. I don’t usually believe my dreams, but as we sat there, waiting for the musical to start, I was scared. What if my dream was a vision? What if someone came and shot everybody? I’ve always been aware of the possibility of me dying, and for the last few months I’ve been more or less conscious of it. But last night, I told myself, this could be it. This could be my last day on earth. Obviously, no shooter came, as I’m still here, but I realized something important last night. I am not afraid of dying and going to heaven – of joining my family up in paradise. Of falling to my knees and worshipping my King. In fact, I’m ecstatic! I love being alive here on earth, but I also look forward to living in heaven. But what I am afraid of is standing before the judgment throne of God and trying to explain why I didn’t obey Him. 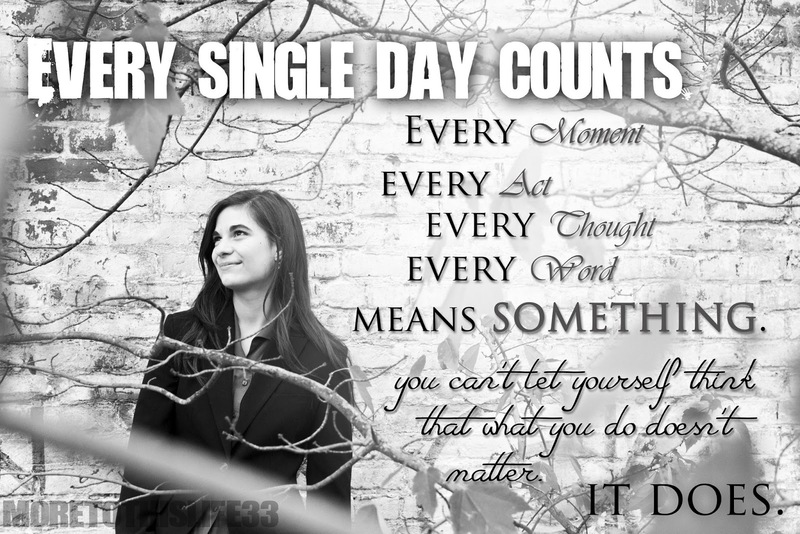 Every single day counts. Every moment, every act, every thought, every word means something. You can’t let yourself think that what you do doesn’t matter; it does. What you do or don’t do has the power to effect someone’s eternal destiny – even your own. How can we not care? I think that if Jesus were to come back right now… I would apologize. I would tell Him that I am so sorry for not taking life seriously. For not taking Him seriously. God gave us His written word for a reason, and that reason is not so that it can get covered with dust. He gave us the Bible so that we can know how we are to live. It’s time for us to get serious about Christianity. We need to be ready for the return of Jesus. If you haven’t been living in the way that you should, repent. If you haven’t been putting time into your relationship with God, do so. If you’ve been living in sin, turn and run the other way. It is never too late to turn back. God is there, waiting for you with open arms. So now I ask you. What would YOU do if Jesus came back right now? Yes! Mariah, you should write a book full of these thoughts you've written. It's really inspiring - lately some of what you've written, has been what I really needed. Thank Jesus for speaking through you, Mariah! By the way, I, Megan or "Lucy Anne" am the person that told you about ApricotPie... God bless! Thank you for reminding me Riah! I will try to not waist the chances God gives me.